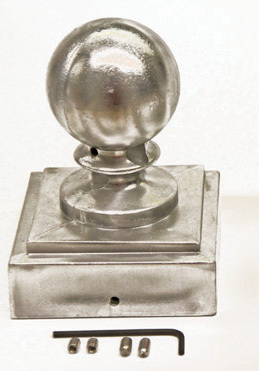 Replacement Ball Top for 3" square poles. Made from aluminum these ball tops have the holes drilled to accommodate 3/8" top perch rods and have tapped holes with set screws to seat and hold ball top at top of the pole. Fits 3" square aluminum or steel poles. This Ball Top came with my T-14 pole. It holds the perch rods in place and it makes the pole look beautiful. I would recommend this Ball Top to a friend.